One of the most exciting things I found at #ISTE2015 was a school bus transformed into a technology learning studio. The bus is operated by Estella who at age 79 is a self-identified “Gadget Gal.” She loves technology and gadgets so much, she wanted to bring them to others in her community who might not have access to computers and the internet. So, she drew up her dream on a piece of paper and put the word out that she was looking for folks to help her bring this to life. She found volunteers, donors, and invested much of her own retirement funds on the project. That was eight years ago. Below is a picture of Estella in her bus today. Estella travels around Palm Beach County talking with schools, communities, and local agencies to see how various technology services she provides can help them. This might include digital citizenship, literacy, GED or test prep, tutoring, homework assistance, resume writing, and more. Estella understands that not everyone has access to technology and the internet, so she brings it to their door...literally. She says, "When kids get on this bus, they're able to learn about the world and connect with the world using Microsoft technology and I can empower them to make their lives better." Estella says she is grateful for the contributions she has received from Microsoft YouthSpark to help bring her dream to life. She said she feels blessed because she has been fortunate enough to have people step up to the plate and say, "Let me help you do what you're doing because I believe in your cause." Estella explained that because of her dad she grew up around trucks and buses. Little did she know back then, this would help prepare her for most recent passion. In addition to supporting the local community, Estella has also taken her show on the road. Last summer Estella’s Brilliant Bus took a “Tech Innovation Bus Ride.” They journeyed on the “Road to Yes We Code!” A multi-city bus caravan roadtrip traveling from West Palm Beach, Fla; Atlanta, Ga; Birmingham, Al; Selma, Al; Memphis, Tenn., Jackson, Miss, New Orleans, La. The Tech Innovation Bus Ride featured turnkey hands-on custom coding classes, robotics and tech entrepreneurship workshops.Most recently, Estella was featured in a Superbowl commercial which you can see here. To innovative educators, the idea of a mobile technology learning studio is fascinating. 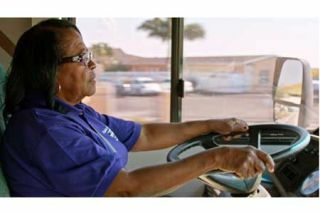 What if we wired up more school buses like Estella’s? Rather than sitting in a bus depot, how could they be utilized during school hours? What about in rural areas or others where students spend a significant amount of time on buses? This commuting time could be utilized for homework time, tutoring, reading, and more. What can you imagine doing if your community had a mobile technology learning studio? What kind of programs and services do you envision taking place?Want to follow what's new with Estella's Brilliant Bus? Like the Facebook page here.